Saudi Arabia’s decision to call off the Initial Public Offering (IPO) of national oil company Aramco has grabbed news headlines around the world and led to rumors inside the Middle East. Billed as the biggest IPO in the history, the Aramco offering was an important cornerstone for Saudi Arabia and the Crown Prince Mohammed bin Salman’s (MBS) 2030 vision that relies on replacing the country’s dependence on oil with a productive independent economy. Several setbacks came following the report; including the Energy Minister, Khalid al-Falih’s statement to media confirming that the government was committed to the deal at unspecified date in the future, denying reports on cancelling the deal. Later on Monday, Reuters reported that King Salman has played a role in shelving the deal in a step highlighted the dispute between the King and the Crown Prince. 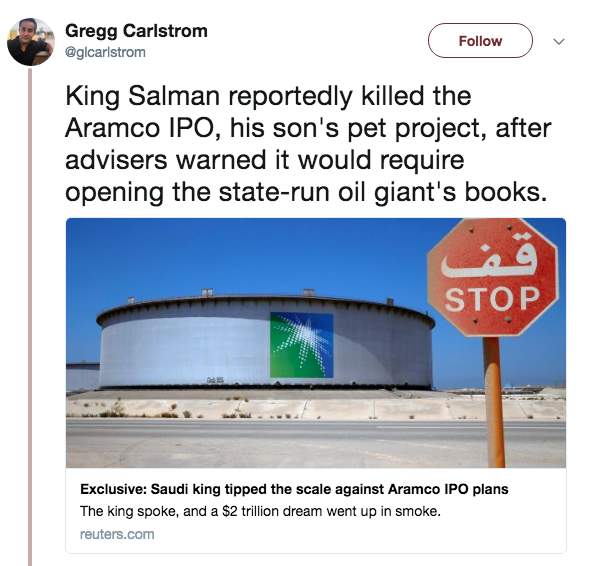 Evidence suggests that the King of Saudi Arabia did not want the financial details of Aramco publicly available, presumably calculating that such information could drastically alter the value of Aramco as a whole. On social media, the news raised controversy with some people hailing the step and others criticizing the uncertainty that surrounded the IPO listing deal. 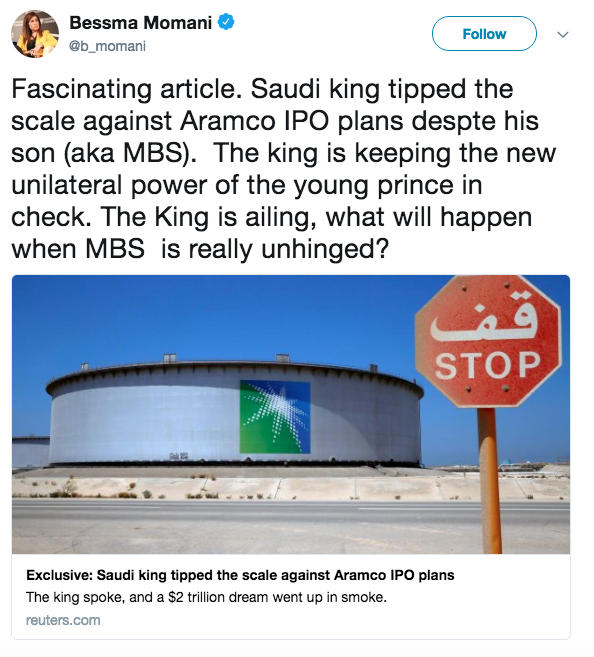 Some users went to argue that Aramco’s IPO cancellation was related to Tesla’s privatization deal. The deal was announced earlier by Tesla’s CEO Elon Musk in August 7 and it will be secured by the Saudi government. However, Musk later announced that the deal was canceled. His announcement came a day following the Aramco IPO announcement. Others highlighted the noticeable uncertainty that has been surrounding Saudi Arabia economic and foreign policies especially after MBS was appointed in 2017.